LATEST JOBS IN BAHRAIN EMPLOYMENT OPPORTUNITIES – Bahrain Client Interview Mumbai .Register with Proffered location IMMEDIATELY. Urgently required For A Leading OIL & GAS / Petrochemicals / Refiners. Candidates who are Seeking For the Latest BAHRAIN JOB VACANCIES can check the details of Latest Jobs in Bahrain Airport that have been recently Posted in this site. Here we are Updating all the details of the Jobs in Bahrain like Job Description, No. Of vacancies, Salary Offered, Educational criteria Etc.., Interested and Eligible candidates can check the Job Interview Details. 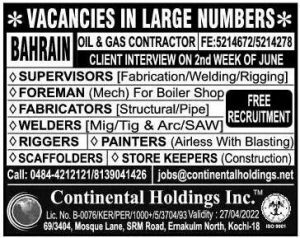 HUGE JOBS IN BAHRAIN – Urgently required For a Leading oil & Gas Contracting Company Applicants must have Exp in Oil & Gas / Petrochemicals / Refineries. QA/QC Inspectors – Painting required Educational Criteria Is Diploma (Mech) + BGAS with 5 + Yrs . Exp, QA / QC Engineers – Project required Qualification – Degree (Mech) + CSWIP with 10 + Yrs Exp. QA / QC Engineers – Welding required Qualification – degree (Mexch) + CSWIP with 5 + Yrs Exp. QA / QC Inspectors – Mech required Qualification – Diploma + CSWIP with 5-7 Yrs Exp. QA . QC Inspectors – Civil required criteria Deg / Dip (Civil) with 3-5 Yrs Exp. Interested and Eligible Candidates can apply for the Job Interview. 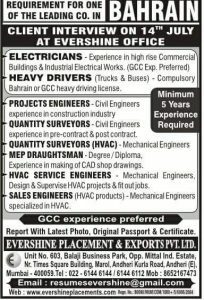 NEW JOBS IN BAHRAIN – NDT Technicians – ASNT Level – II, RT, PT, MT with 3-5 Yrs Exp. Document Controllers – Graduate with 5-7 Yrs Exp required. Store Keepers – Graduate with 3-5 yrs Exp. Very attractive Slary + Perks, 2 Yers renewable Contract and ample growth potential For PRIORITY register in advance. Ankita Travels Manpower Consultants Lic# : B-0251 / MUM / PART b/ 1000 + / 5 / 4290 / 94. Eligible and Interested Candidates can Send their Cv to the Email ID : [email protected] Cosmos, Plaza, Unit # 204, Next to D.N. Nagar Metro Stn J.P. Road, Anderi (w) Mumbai – 400 058 Tel: 26377700 / 9820453282. This is balaji. Am a diploma mechanical holder. Currently am working as a quantity and quality incharge of reputed company at coimbatore. I would like apply and attend the interview. Kindly let me know the location in chennai. Waiting for your feedback. And drop your no. Thru my mail. Do you have any jobs related for electrical engineer with total 3yrs experience in which 2yrs is at Qatar. Dear sir my total experience 6th years in gcc as a duct fitter and fabrication please contact me i have good about ducting works thank u waiting for your reply.